Although it is little spoken of today, in March 1988 came a UFO sighting that not only had multiple witnesses but was confirmed on the radar systems at Gatwick Airport. Furthermore, motorway security CCTV cameras would capture almost forty minutes of the incident on video. It would appear to UFO investigators that video evidence of alien crafts was finally at hand. However, the film was quickly classified, and perhaps would have remained secret had it not been for the leaking of several still frames from the footage by one of the UFO Investigators involved with the case. Just what did happen that evening over the M25 just outside of London? And did the incident share a connection to the several other UFO sightings of the early months of 1988? It certainly seems that whatever did take place that evening in the south of England, it was of apparent importance to those in high-ranking positions. And, as we will examine shortly, continues to remain so even today. On the evening of 4th March 1988, at a little after 9 pm, call after call would come into the emergency switchboard operators regarding strange and mysterious lights hovering in the sky over the M25 motorway, near Reigate, London. Three police officers would respond to one of the calls – that of Joe Clarke. When they did, far from expecting to discover anything of significance, one would ask upon arriving “where are the little green men?”. However, they would see the strange objects with their own eyes shortly after. Clarke had first noticed the objects at just after 7pm after going into his garden. His wife and daughter had actually told him an hour previously of “two parallel lights approaching” but he paid little attention. He telephoned several relatives around different areas of London and they too could all see the strange anomalies. He would go on to tell the 10th March edition of the Reigate and Redhill newspaper. Clarke would estimate the object to be around 100 to 200 feet across and at an altitude of around 2,000 feet. The police would begin to request reports from local airports, most notably, Heathrow and Gatwick. Unbelievably, radar controllers at the latter would claim they did indeed have “something strange on the screen we can’t account for”. Further requests for reports of other sightings would reveal that residents as far as Watford and Wimbledon had also made reports. The Clarke family would continue to watch the strange objects for around an hour after the officers left. The mysterious glowing objects then calmly left. That the incident had multiple witnesses was not lost on UFO investigators. Nor was the video footage. Refusal By Police To Release Footage Of UFOs! In fact, according to reports quickly circulating in the local press at the time, the whole incident was indeed captured on the motorway security cameras. However, Hertfordshire police, while not denying the incident, were quick to state they would not release the footage to the public. Chief Inspector, Chris Partridge would state to the 10th March edition of the Watford and West Herts Review newspaper that: There were several bright lights seen in the sky which we have not been able to explan…Two light were moving and two were stationary. We had a police car in the area and we trained a camera into the sky. But the tapes will stay in our record. We have made every effort to find out what it was, but haven’t come up with anything. And it didn’t cause any difficulties in the area! This would frustrate UFO investigators who had picked up on the case. It would also create an air of suspicion due to the refusal to release would could be evidence of intelligence behind the UFO phenomena. 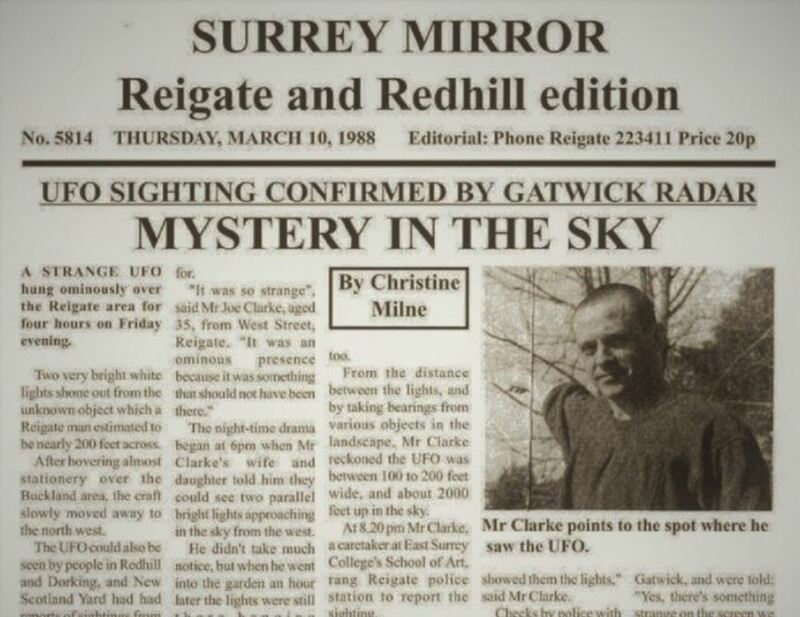 According to Gordon Creighton, (at the time) editor of Flying Saucer Review magazine, the police and, in turn, the government have many such sightings but have “a policy” of withholding them from the public.Given the above, it would certainly appear that the Reigate sighting is important. It also appears the incident was downplayed and even ignored as much as possible by official channels. This, to some, raised suspicions of some kind of inside knowledge. Might these craft be of a terrestrial origin in the form of top-secret military aircraft? Would that, for example, explain the secrecy? Or is it more likely, if this was the case, that such channels would simply state it was military concern? So, if it isn’t a military aircraft, are we then to assume that the craft was extraterrestrial in origin? And if so, should we accept that the police are also aware of this? Are they perhaps under instruction to dismiss such cases for fear of causing public panic? Or might there be more involvement between such authorities and these mysterious visitors than most of us dare even imagine? NOTE: The above image is CGI.